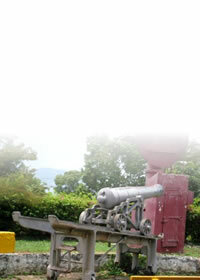 Welcome to the JNHT St. Andrew Heritage Sites. Admiral Mountain Great House - in 1780 was the property and residence of Admiral Peter and Lady Parker. Cherry Garden Great House - The Cherry Garden property was originally a sugar estate. Mona Great House - is of Jamaican Georgian architecture with thirteen rooms. 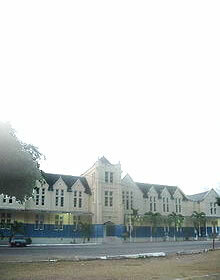 Jamaica College Buildings - In 1902 a law was passed for the amalgamation of the Jamaica High School and the University College under the name of Jamaica College, by which it is still known. Mico College Buildings - established as a result of funds bequeathed by Lady Mico in 1690 to her nephew Samuel, on condition that he marry one of his cousins. Shortwood Teachers' College - began operations on September 28, 1885. Plumb Point Lighthouse - built in 1853 eleven years after the construction of the Morant point Lighthouse. 24 Tucker Avenue - former residence of the late Sir Alexander Bustamante. Regardless - built by A.D. Scott around 1962. Edna Manley also speaks of life at "Regardless". Bob Marley Museum - former residence of the Hon. Robert Nesta Marley. Craighton House - named after its first owner, George Craighton. Devon House - a fine example of nineteenth (19th) century domestic architecture in Jamaica. Oakton House - at one time it was an exclusive school and as a guesthouse in the 1920s. New Castle Training Depot - founded in 1841 by Major General Sir William Maynard Gomm. Blue Mountains - Blue Mountain Peak is the highest point in Jamaica at 2255.8metres (7402 feet). Cinchona Botanical Garden - Established in 1868, Cinchona is the only garden of its type in the Caribbean. Clydesdale National Forest Park - This location was once a coffee works. Hollywell National Park - Located in the hills of St. Andrew about four thousand (4000) ft. above sea level. Hope Botanical Garden - In 1881, 200 acres of Hope Estate was purchased by the Government to establish an experimental garden. Papine-Mona Aqueduct - a fine example of civil engineering in 18th Century Jamaica. Hope Aqueduct -Was used to take sufficient quantity of water for turning mills for grinding sugar, out of the Hope River and is still used today by the Water Commission. Long Lane Aqueduct - Built to enable then Constant Spring estate owner,Daniel Moore,to bring water to his estate from the Wag Water River. Today it is still used in supplying water to the city. St Andrew Parish Church - The St. Andrew Parish Church was founded in 1664 and is one of the oldest churches in the country. 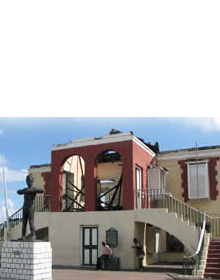 The Jamaica Free Baptist Church - It is a relic of a politico-religious nationalist, and represents the confluence of European influences and Jamaican architectural pragmatism.